Imagine hearing all about natural disasters in other parts of the country or world, but not being able to see them because television doesn't exist and even newspapers very rarely have any pictures. You might be kind of curious. And over time, you might actually develop a rather peculiar fixation with seeing reenactments of these events. You know, kind of like you might go to a Broadway show after dinner. And if one thing was true about Coney Island, it was that where there was demand, there was supply. Lots of it. Enter reenactments of the Mont Pelee volcanic eruption of 1902, the Galveston Flood of 1900, the San Francisco earthquake of 1906, and our featured uplifting show, the Johnstown Flood of 1889. The Johnstown Flood show was located just across from Steeplechase Park at Surf Avenue and West 17th, as you can see in the Historical Map. 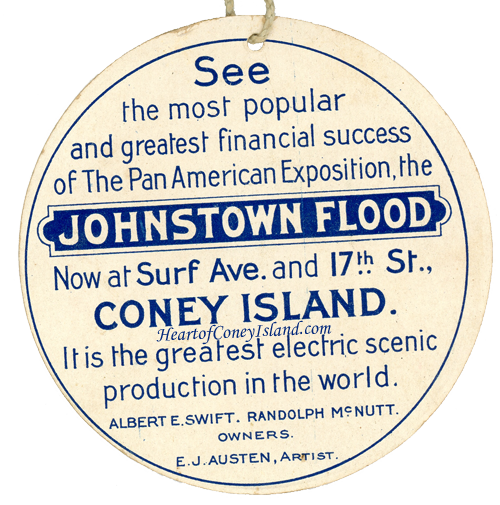 The ticket notes the show's success at the PanAmerican Exposition, which was the Buffalo, New York, World's Fair of 1901. This is the same expo where Thompson and Dundy of Luna Park joined forces and showed their Trip to the Moon. 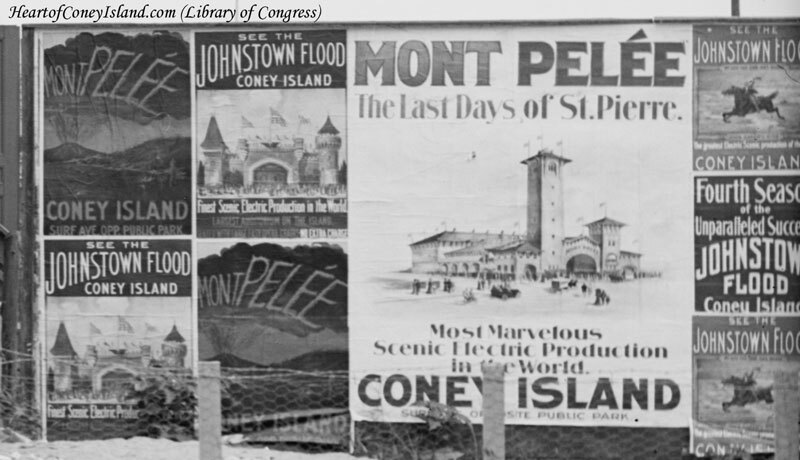 The Johnstown Flood and Trip to the Moon were the exposition's two greatest hits, and both would enjoy the rare distinction of lasting several seasons at Coney Island. 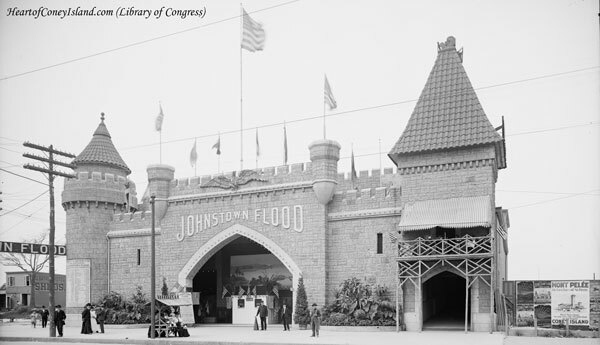 The Johnstown Flood's owners moved the show to Coney Island shortly after the PanAmerican Exposition closed in November 1901, in time for the 1902 season. The picture above was taken in 1905, when the Johnstown Flood show celebrates its "fourth season of unparalleled success" as the "finest scenic electric production." Notably, the image of the rider on the ticket also is show on two of the posters at the right in the photo above. The rider on the ticket depicts a true story. A massive rainstorm in Pittsburgh, Pennsylvania, was making the South Fork Dam increasingly precarious. John Parke, one of the dam's engineers, rode by horse into town to the local telegraph office to ask them to warn town authorities that the dam was about to burst. The messages never made it to the town, however, either because lines were down or because the telegraph office didn't take the warning seriously after several times of the dam's engineers having cried wolf. Shortly thereafter, the dam burst and destroyed literally everything in Johnstown in a really violent fashion, killing thousands of people. The show was a cyclorama, which involved a series of different scenes being reenacted, each with a different large, panoramic, curved backdrop painting to make the audience feel immersed in the scene. The show actually used large amounts of water and steam. And, of course, don't forget the electricity, too. That was a big selling point. They'd spare no expense to reenact explosions and storms at these. 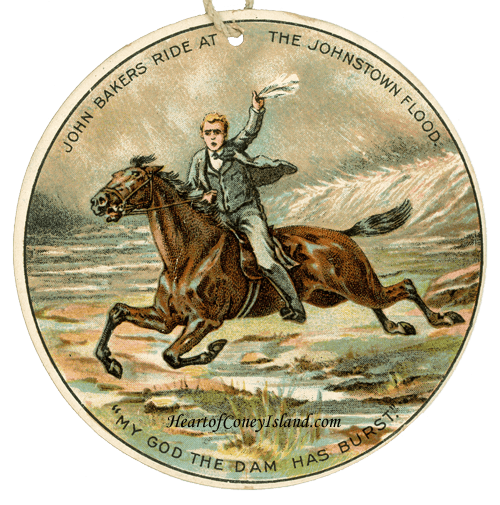 The Deluge replaced the Johnstown Flood show for the 1906 season. Perhaps on the premise of go-big-or-go-home, it went straight to the story of Noah in the Bible and the flooding of the entire world. Its manager, Herbert Bradwell, co-owned the production with West Brighton notables Charles Feltman and Henry Grashorn. Bradwell advertised the show heavily and ran a promotion through major stores under which customers spending over one dollar would receive a free show ticket. The Deluge lasted through the end of the 1908 season. During its final season, many changes were made to the scenery and acts, including a spicy new finale in which earthquakes, floods and fires simultaneously destroyed the world. In October of 1908, the building was leased and converted into a boxing venue by Martin Julian, the brother-in-law of former world champion Bob Fitzsimmons. Julian had been a promoter of the former Coney Island Athletic Club alongside Brady and Alec Brown.